It must be hard to be Peter Jaeger. He’s a hardworking spider specialist who has identified over 200 new species of spiders over the past decade. That seems pretty noteworthy, doesn’t it? Finding 200 new species of anything should be impressive, but it’s not. Why? Because it’s spiders. So what does Mr. Jaeger do to get a little attention? He names a new species of spider after David Bowie. 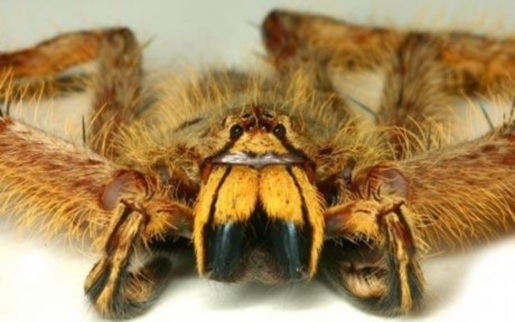 The Heteropoda davidbowie, as the new critter is called, is pictured above. It’s big, blond, and fuzzy. Kind of like David back in his Ziggy Stardust days. Jaeger says he gave the spider a publicity-grabbing name because spiders are rarely included on lists of endangered animals despite spiders being an important part of the ecosystem. I guess spiders aren’t cuddly, even if they are Spiders From Mars. Generally, only cute animals get included on endangered species list, because there’s no money in trying to save living nightmares from extinction.